Welcome to The Syracuse Sports Association Football Leagues! 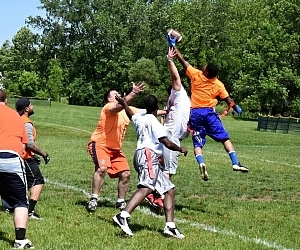 Flag Football sessions run year round! Be sure to sign up early as the leagues normally fill up fast. SSA's official Indoor Flag Football league is played at CNY Family Sports Center on Jones Rd right off 690 in Baldwinsville. -Team fee is $725, Team shirts are with a number on the back are required. They can be purchased through SSA or through a vendor of the teams choice. -For indoor we will be keeping regular season STATs and have awards for the regular season STAT leaders. Pass TD's, Rush Td's, Rec TD's, FG, Def Int, Sacks, Tackles. -7 on 7, 3 down linemen. Teams are required to have the same color team shirts with numbers on them, No exceptions please. All Games are played at Syracuse Sports Assoc Sports Park. Game length: Two (2), 25 minute running-clock halves, with approximately a 5 min half time. Field Size: approximately 100 by 40 yards includes 10 yard end zones. Season: Depending on the league size: Season is 8 regular season games with approximately 2-3 weeks of playoffs. Misc: Flags are provided by SSA and are included with your team registration fee. Teams are allowed to use there own football for offense but it must be at least NCAA regulation size or bigger. Teams are also allowed to purchase their own flag set for game use. They Must be the Adult Flag A Tag Sonic flags. No Exceptions. Please declare your team shirt color upon registration as well. Team colors are first come first serve. Like all of our sports all rosters are filled out online and only players on the online roster are allowed to particiapate. All players must provide a valid email, full name and phone in order to be eligable for league play. Fofeiting teams will be charged referee fee's for both teams unless SSA has been notified of the forfeit 1 day prior to game days. For a complete description of the leagues, registration, and upcoming league dates check out the sign up boxes below. Rules: A complete set of rules, including position break downs is available here any rules not covered default to NFL rules. Our players range from first time players to retired NFL players. We have a spot for everyone and every team. We have a high standard when it comes to sportsmanship and we encourage safe play at all times. Alcohol: Alcohol is NOT ALLOWED on or near the football field if you are participating in Flag Football games. This means you may not drink during the games and officials have the right to restrict you from play if they believe you are to intoxicated before the start of the game.